This is a short post just to assure you all that I am still alive and kickin’. I am a member of a local art group which was formed 40 years ago by a group of teenagers (I was one of them). The aim of the group was to give local artists an opportunity to exhibit their work. From the outset, the emphasis was on showing, not selling the work. This year was the 34th annual exhibition. As a working member of the group I’ve been busy with the staging of the exhibition which had over 200 pieces from 55 artists. As part of my contribution to the Athy Art Group Exhibition event, I usually do a demonstration oil painting. Its a difficult thing to do in front of a group of spectators who are encouraged to ask questions as the work progresses. The most difficult bit is producing a finished ‘acceptable’ painting from a blank canvas, in about 1 hour. Any longer than this will be boring as the spectators includes casual onlookers as well as artists. Its a great way of encouraging non oil painters to ‘give it a try’ and it does work. This also happens to be part of the reason I started this blog. Unfortunately I don’t have a video. The colours and technique are the same as ‘Tintern Sunset‘, which has a video here. After this week I will be painting again as usual and I hope to see you then. 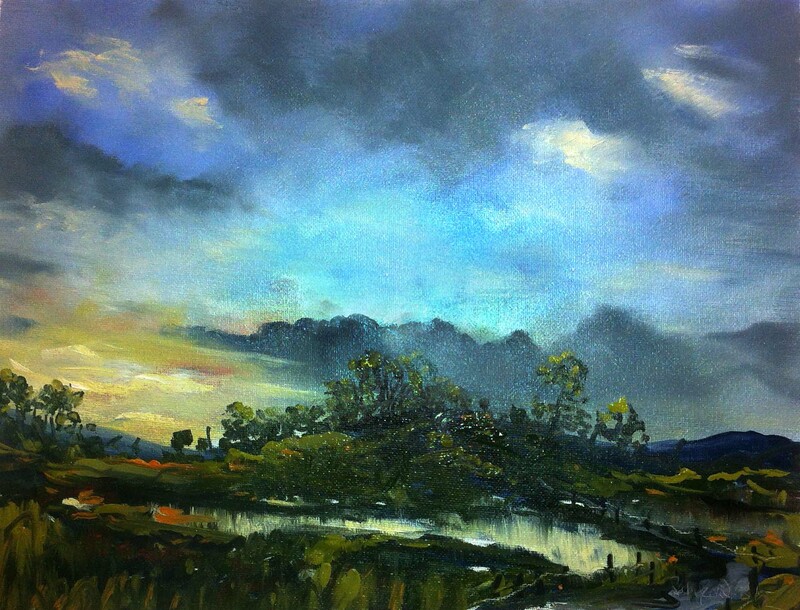 This entry was posted in Oil Painting and tagged Art, Culture, Education, Inspiration, Irish landscape, Oil Painting, Oil Painting Instruction, Oil Painting Landscape, painting, Pictures. Bookmark the permalink. Absolutely, and not to be recommended for every painting. Glad you are ok. Missed you. Sometimes busyness is good when helping others. Grgeous. Like news about your art group. Thank you Beatrix. This is the nice part of being a member of a group. Oh my goodness, this piece of art was done in an hour?!?!?!!!!! So this is what I can look forward to achieving in 40 years. I just hope God gives me the good eye and steady hand to do it. Moral of the story: if you like to paint, start early (in fact, come to think of it, I started painting when I was 8 but stopped…:( imagine the possibilities) Thanks for sharing and congratulations on your 34th exhibition, quite an accomplishment! Glad to see you left the grays of winter behind, even if only temporarily–love the vibrant color in this one! The grays are gone and the greens are in. But Ireland and the UK are suffering extreme wet weather at the moment. Its hard to find summer between the showers. I like the misty character of this painting, it leaves more work to the phantasy of the viewer. Thank you Katleen. This painting is approx. 14″ x 10′. To complete it in an hour I had to make it small. A fine looking demo piece. I have done the same (demonstrating among a group of onlookers) and there is nothing harder for me than engaging in conversation while trying to paint. Job well done. Thanks Stephen. Stressful describes it well. This is by far my favorite of your paintings! I am a sucker for color, so that may be part of why – but to me it is just very visually striking overall. I’m glad you like it maggie. My paintings very much influenced by the seasons and resultant weather conditions. I am looking forward to doing more ‘summer coloured’ paintings over the next few weeks. I hope you like them as much as this painting. I paint really slow and often will sit and stare at stuff thinking, so I would be REALLY boring to watch. 🙂 I love the idea that you and others put together an event for artists to share their work. I would love to find something like that here in Reno. I’m sure there are others in your area who are thinking the same as you. The forming of a group of like minded people is the difficult part, but its not impossible. Investigate the possibility of forming contacts with others and who knows what might happen. Once a group is formed, anything is possible. Curiously, the most important members of an art group are the ‘non-artists’. You guys are doing gr8 for youngsters watching the experienced guys like you working in front of them, i bet they would be learning loads. I wish we can have such groups here as well. About your painting… i loved it.. Thank you Aroog. Art is all about sharing.